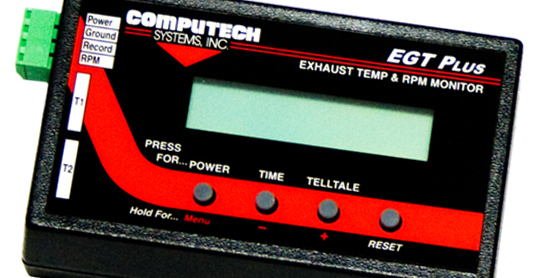 The Computech EGT Plus Exhaust Gas Temp Monitor is one of the most accurate dual-channel EGT systems available on the market. Designed to monitor not only exhaust gas temps, but liquid temps, tires temps, track temps and also engine rpm. Featuring record options that shows max, beginning and end of run. The EGT Monitor can be activated via remote switch, trans-brake event or in continuous record mode. Below are links to EGT Plus Instructions, Downloads, Tutorials & Products. Where can I get the EGT Plus Manual? You can download the EGT Plus Manual Here. Where Do I Mount The Weld In Bungs? The weld in bungs should be mounted 1.25″ from the header flange. It can be mounted from any direction as long as it is 1.25″ from that header flange and the probe tip is able to reach the center of the tube. Please keep in mind that these are general recommendations and you should consult your engine builder for a more specific number for you setup. Hold down the reset button while powering up the EGT Plus. Continue to hold the Reset button for 5 seconds and you have performed a factory reset.